With summertime fast approaching, it’s time to prepare for uncomfortably high temperatures and stifling humidity. Is your metal barn ready for the heat? To ensure the health and efficiency of your horses, you must make sure it’s well-ventilated. Here is a simple guide for properly ventilating your barn and maintaining healthy air quality. You have a couple of options when deciding how to ventilate your mental barn. Natural ventilation is the simplest strategy because it does not require high-cost equipment or mechanical training. Instead, adequate airflow is maintained through the proper placement of doors, windows, eaves, and vents. This tends to be a popular choice in upper mid-west areas where climates stay relatively cool in the summer. 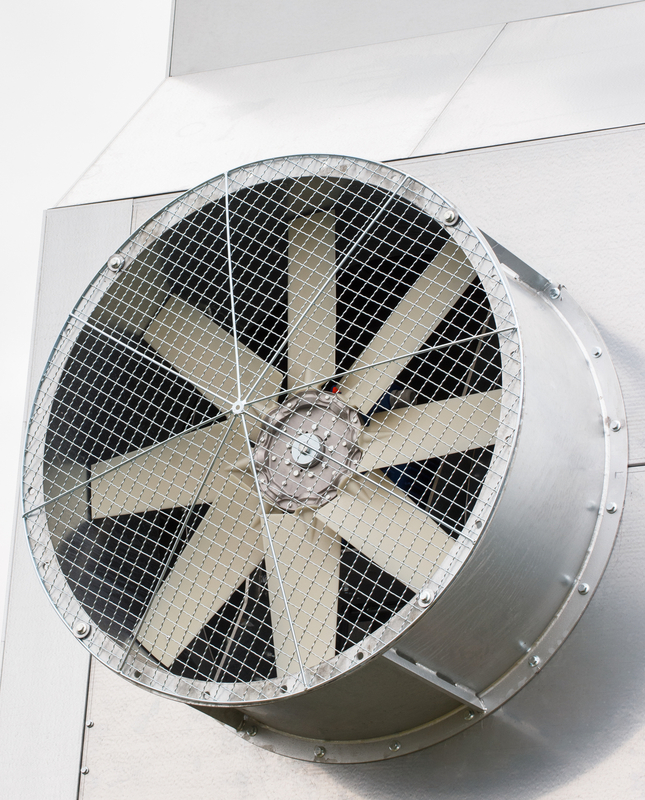 If you live in an area where temperatures can soar, power ventilation might be better for your metal barn. These systems include mechanically-operated exhaust fans, inlet valves, ductwork, and vented cupolas, many of which can be controlled by thermostats and timers. While mechanically ventilated horse barns are typically more expensive to install and maintain than natural systems, they give you greater control over circulation and air quality. A metal barn with a steep roof pitch provides open space above your horses where stale air can rise and exhaust can rise through the roof’s peak. Meanwhile, fresh air comes in through the vented eaves, enhancing airflow and air quality. This is particularly helpful if you have a natural ventilation system; experts recommend a roof pitch rise/run of at least 4/12 or 5/12. Keeping your metal barn clean and dry will go a long way toward maintaining good air quality. Manure must be managed, and stalls must be cleaned daily. Rubber stall mats can help reduce moisture, dirt, and dust buildup as well as make removing manure and soiled bedding much easier. They also provide your horses with greater comfort and can help prevent leg, knee, and hoof fatigue. If you’re planning to build a metal barn, turn to the certified contractors at Trinity Metal Buildings in Slocomb, AL, to ensure it is properly ventilated. For over 15 years, this locally owned business has been providing top-notch building construction services, handling everything from barns and hay shelters to metal building supplies and custom home building. Check out their website to see how they can help you build your barn, and call (334) 886-9078 to speak with a contractor today.